The links in this post are referral links. If you sign up for the Erin Condren newsletter, you will receive $10 off to use on your order. I don’t know where I would be without Erin Condren. I have posted a couple times on the blog about how much I depend on my Erin Condren Life Planner for both my business and my personal life. For a long time, I couldn’t find a good system that worked for me. The Life Planner was a total solution for me with space on every day to keep track of my separate to-do lists plus space for large picture monthly/yearly planning and lots of note pages for brainstorming, stats and other important info I want on hand. It goes with my everywhere! Erin Condren doesn’t JUST have amazing life planners though. The website is full of personalized items with gorgeous designs for almost every area of life – canvases, stationary, family organizers, wedding planners, candles, iPad stickers, phone cases, luggage, and more! And again, everything is PERSONALIZED. 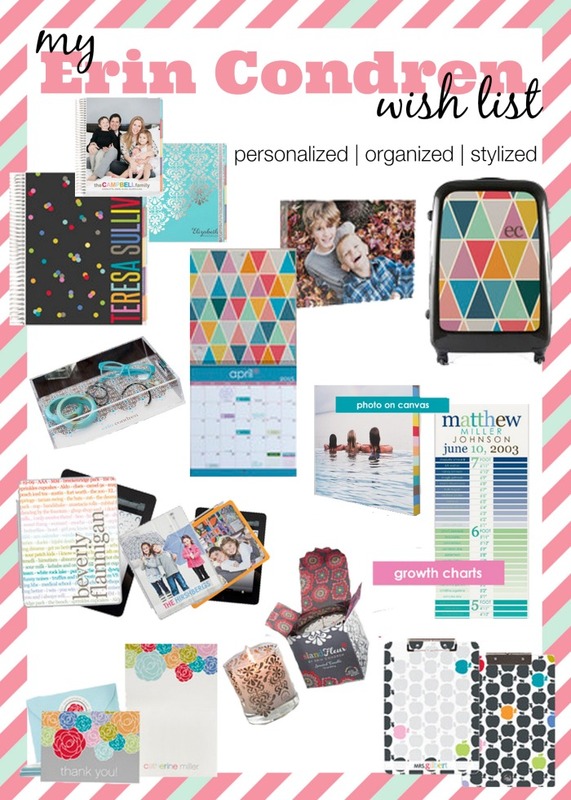 Check out some of the items that I want for myself and that might also make it onto your Erin Condren Wish List. 1. Planners – You can’t talk Erin Condren without talking about their planners – Life Planners, Teacher Planners, and Wedding Planners. All come with multiple designs to choose from and interchangeable covers, which I love! The covers can also be personalized with names and photos. It’s really perfect for school and work because it can so easily be identified as yours. Plus, if I was getting married now that I know about Erin Condren, a wedding planner customized with photos of us would have been a given. 2. Canvases – What I love about the photo canvases at Erin Condren is you can create a custom border if you would like. For example, you could have a black and white photo with a colorful stripe border or you could write a baby’s name and age on the side. So many choices! They also sell some stunning quote canvases I want for my office and cute growth charts for kids. 3. Acrylic Photos and Trays – Yes, they have the photo canvases, but they also have acrylic photo frames and acrylic photo blocks. The back of the photo blocks can also be personalized with names, years or a significant quote. Then, there are these gorgeous acrylic trays that I love. I definitely want to get one for storing jewelry on my dresser and have my eye on a photo one for our coffee table. They are practical without losing the wow factor. 4. Stationary – I love my technology, but I will always be a pen and paper gal. Erin Condren has a beautiful collection of personalized stationary, from folded note cards and flat notes to pads of paper. I also really love their collection of general occasion and birthday cards. You will also want to check out their invitations and holiday cards because they are amazing as well. 5. iPad stickers and other devices – Right now, they have their fun iPad stickers in stock. You can upload a photo or personalize one of their cool designs. How fun would this be for new grandparents with a baby photo or practical and colorful for a student at college? They do sell phone cases and other fun device items, but they are in a transition phase with the new models, so I’m not sure when all of them will be listed. 6. Recipe Cards and Boxes – I really love this idea for a newlyweds or kids just moving out of the house. I loved receiving recipes from my mom when I struck out on my own. 7. Office Organization, School Materials and Family FUNctional- Erin Condren started with Life Planners, so colorful but practical organization is at their roots. You can create personalized notebooks, which I have posted about before, as well as office organizers, storage, and file folders. They also have dry erase clip boards which would be awesome for a teacher or coach in your life! PLUS, they have lots of family items, like chore charts, fridge schedule calendars, travel checklists, and more! 8. Candles and Body Scrubs/Lotions – All of their products have their unique style and flare, so the candle holders are beautiful and high on my buy light. I just love a good candle! 9. Luggage – This is definitely one of the big ticket items, but I want one! I love the idea of having easily identified luggage on the carousel. This really doesn’t even begin to cover what Erin Condren has to offer, and they are constantly adding more items. I’m so excited to see the new phone cases they list, too, since I will be getting a new phone soon. Don’t forget that if you use my referral link and sign up for their newsletter, they will email you a $10 off code to use for your order. Which items stands out to you the most? I am not the only one sharing wish lists today though! 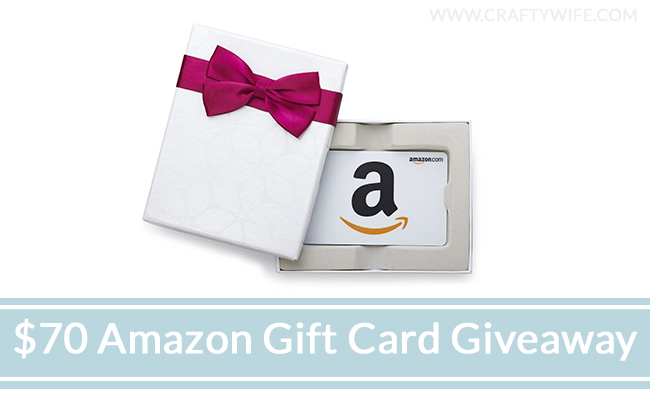 You can see other bloggers participating below PLUS a giveaway form to win a $70 Amazon gift card to help you with your holiday shopping. I don’t know about you, but I am so excited to hop around and see what other bloggers have found because I definitely need ideas to round out my list. Do you know exactly what you want or are you still struggling, too? I’m obsessed with EC too! Love love love my planner, and your wish list is making me want a whole bunch more. Love your blog. Love these!! I’ll definitely be checking out some of those planners!! I have been looking all over for a good planner, and I keep coming back to the Life Planner because you talk so highly of it! I may have to add it to my Christmas list now. Also, I love the unique boarders on the canvases! What a cool idea! I need to get to work on my Christmas shopping and these look like such good and unique gifts! !